Buddhist sculpture slab from the monastery at Mian Khan, Peshawar District: Buddha meeting the elephant. bl.uk > Online Gallery Home	> Online exhibitions	> Asia, Pacific and Africa Collections	> Buddhist sculpture slab from the monastery at Mian Khan, Peshawar District: Buddha meeting the elephant. 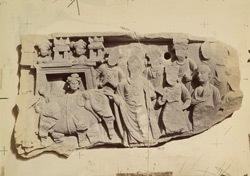 Photograph of a Buddhist sculpture slab from the monastery at Mian Khan in Peshawar District showing the Buddha meeting the elephant. This is one of a series of photographs taken for Cole at Mardan by Serrot, and not, as Bloch's list states, by Cole himself. 'This sculpture was found very much damaged. it represents an often-repeated scene. Devadatta caused an elephant to be drugged in hopes of his charging and destroying Buddha. People assembled at the city gate to witness the event, but instead of harm the animal does obeisance...' Reproduced in photogravure in Illustrations of Graeco-Buddhist sculptures from the Yusufzai District, in vol. I of H.H. Cole, Preservation of monuments in India (c. 1885), pl. 30.